Handpresso’s Pump Pop manual espresso maker is a lightweight, battery- and electricity-free espresso device for any outdoor activity. The eco-friendly device is powered by manual pumping, like a bicycle pump. Once pressure has reached the correct level, all that is needed is hot water and espresso coffee – either pre-ground or in a pod. The espresso coffee flows right into the cup. The Pump Pop’s reservoir fills with a little over 1.5 oz of water. 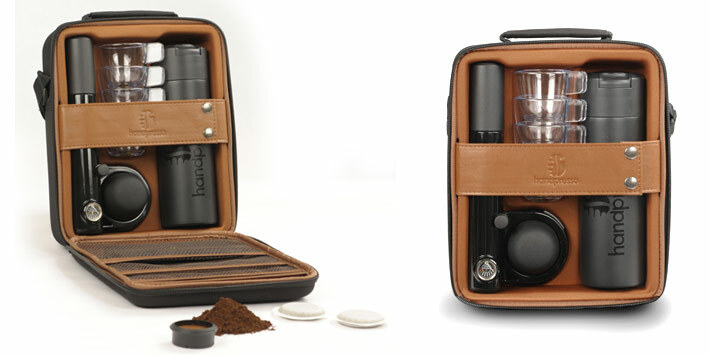 Remember, this is true-strength European espresso we are talking about – Handpresso is a French company! The device itself weighs little more than a pound, and measures about 9 x 4 x 3 inches. The Pump Pop is available in pink, apple green, and sky blue. Handpresso offers a warranty of one year.